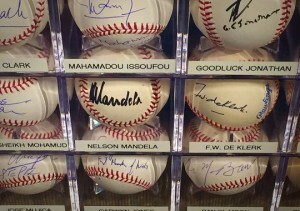 At the center of the show is the internationally recognized Randy L. Kaplan Collection of 181 baseballs signed by world leaders and heads of state, including Nelson Mandela, Mikhail Gorbachev and President Obama. 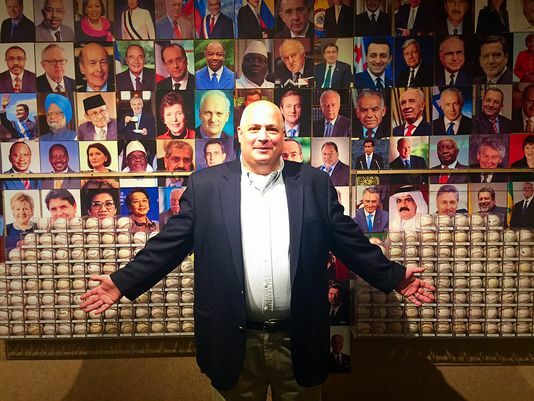 Kaplan, 48, a governmental affairs specialist in New York, eschewed an autographed baseball collection heavy with signatures from players, music icons and movie stars in favor of world leaders because they represent history, he said. Then President Bill Clinton kicked off the collection when he signed a ball in 1996 at a Washington, D.C., meeting. Right off the bat, Kaplan was hooked tracking down leaders and working with aides and even his own lawmakers. Kaplan said his hobby isn’t an easy one. “With world leaders, you know the security and the access is impossible,” he said. But he relished the challenge of gaining that access and the fruitful lengths he went to for autographs. In 1996, he learned a Russian passage hoping to persuade Gorbachev to sign a ball at a book signing. “I had an edge, and I was able to get it done,” Kaplan said, noting that he was the only one that day to get something signed other than a book. He doesn’t pay for autographs, and he or a top government official have been behind each signature. Kaplan tapped his friend, U.S. Rep. Greg Meeks, for Nelson Mandela’s autograph during a Congressional Black Caucus meeting in 2005. “Mandela said to him, ‘I better not see this for sale on eBay,’ ” Kaplan said. Kaplan said he always is walking around with official Rawlings baseballs looking for autographs. “They are the best quality balls to use,” he said. But he’s less picky about the writing instrument. “It’s whatever they want to use,” Kaplan said. He said he’s met resistance from some, but most usually concede that his collection is worth being a part of. “When they see the list of the people who have signed, a lot of people want to be a part of it and are very proud to be a part of it,” he said. 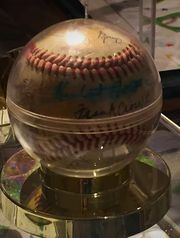 In addition to Kaplan’s autographed baseballs, visitors can expect to see baseball memorabilia from the Hoover collection and details about the history of the Cedar Rapids Kernels. “Iowa has a rich baseball history, so we wanted to include that in some way,” she said. So Wier contacted the Kernels and now Hoover has items on loan from the team and a time line of the Kernels’ history and items from local legends such as Beldon Hill and Art Pennington. “It doesn’t tell everything about Iowa baseball history, but it gives you a glimpse of one story,” she said. Visitors will be able to learn about the game while interacting with a simulated baseball field. “It has an intimate feel to it, but then in the center of the main room we recreated a baseball stadium, so that kind of has an effect when you first walk in,” Wier said. Bruce and Ellen Collins, both 72 of Elkader, are Hoover members who attended an exhibit preview Friday night. Last fall, the couple visited the National Baseball Hall of Fame and Museum in Cooperstown, N.Y., and compared it with the exhibit in West Branch. “This here is geared toward Iowa and Iowa players, and this is very interesting to us, too, because we’re Iowans,” Bruce Collins said. Ellen Collins also enjoyed a chance to learn about Hoover’s love of the game. “I didn’t realize he had enjoyed it so much until I saw it here,” she said. Wier said Hoover rooted for the New York Yankees, but in examining his annual baseball season passes and correspondence with coaches and players, he loved every team. Some of those season passes are on display with the exhibit. “Those were kind of made billfold-style, so they held up well,” Wier said. Museum-goers should be sure to seek out a baseball signed by Hoover, which is easy to overlook because so many other signatures are on there, Wier said.